The weather was perfect today and the Grand Canyon of the Tennessee was beautiful. 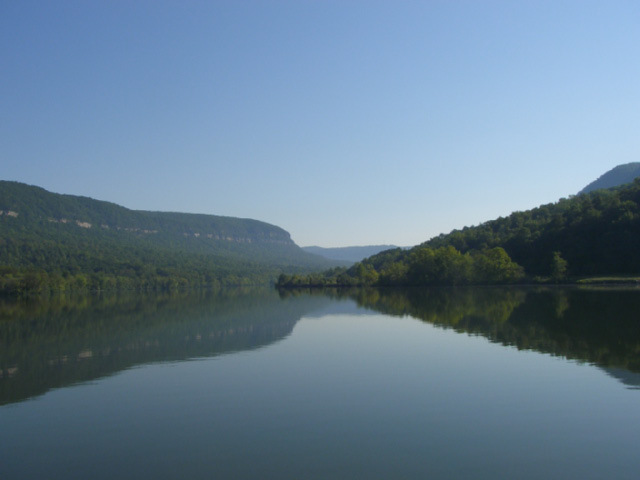 The photo was taken just below the pumped storage facility on Raccoon Mountain. The major disappointment at Chattanooga was the fact that the new docks are cutoff from the aquarium due to construction on a bridge that crosses the docks as well as a new condominum being built. The result is you have to walk up 49 steps then climb a switchback affair to the Hunter Art Gallery. Only then can you get on a city street and get to the aquarium. We toured the new salt water unit today. It has an amazing butterfly room with live butterflys flying around through a tropical jungle. The other really interesting room is the invertibrate collection of jelly fish some of which light up like led toys. The main tank is almost overwhelming there are so many fish swimming about. After the aquarium we saw the Imax movie "Deep Sea 3D". It was spectacular and the best 3D effects I have seen yet. We had dinner aboard. Tomorrow we will take a rest day here and cross the walking bridge to the other side of the river and check out the new park there.